So, it came to my attention that as open as I am to my diet, there are a few items that I don’t think I can bring myself to eat. One of those things is mayo . You see, I can’t find a way to put it in my food that makes me feel like it’s worth the calories. Mostly it’s because I know I’ll put on way more than one serving if I get my hands on a jar of it. Some day I’ll tell you about my childhood and how much mayo I’ve consumed in my lifetime so far. So I’ve been thinking of a way that works in my favor, and I think I came up with something that will work. I needed something creamy, something with some nutritional value, and something that I wouldn’t notice the mayo was missing. A light bulb went off. Duh! Avocado!! So I looked for the ripest avocado that I could find and began mashing it up until it was smooth. I ended up using a ladle since I couldn’t find my potato masher . Innovation at it’s best! In that went one teaspoon of lime juice, sea salt, cayenne pepper, and garlic powder. I mixed that, then threw in some minced celery, orange pepper, green pepper, and finally the minced chicken. 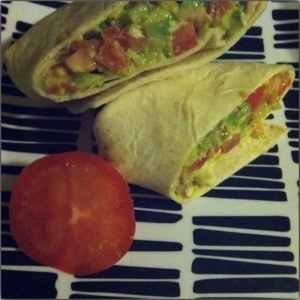 With bit of diced tomatoes, rolled in a wrap, I mean that was a serious chicken salad wrap! Want to try it? Let me know how it came out! Thoroughly mix together all ingredients except the tortilla. Fill tortilla with mixture, roll wrap, enjoy.